These past few weeks I have been researching on what causes adult acne. Even though acne does not signal systemic disease, it can cause undesirable effects, from scarring to skin discoloration. I have struggled with mild acne after each of my pregnancies, and have sought treatment for this issue and an understanding of its causes from regular doctors, naturopaths, and dermatologists, and skin care professionals. At best, I found temporary relief from the condition; unfortunately, nothing lasted over the long-term. The last dermatologist I went to actually suggested that I take antibiotics! Antibiotics are for infections, and I believe that most illnesses can be cured through food, not pills. With my research, I started with what you put in your body. I determined that sugar is the biggest cause of acne. Sugar is everywhere; you’d be surprised to learn how much sugar even supposedly "healthy" foods have. Just look at the ingredients list on each packaged food item when you shop for groceries. Many people have a sweet tooth, though. If you’re one of those people, you need a strategy to reduce or eliminate sugar from your diet if you’d like to have clear skin. Everything starts with baby steps, so to get started on your path to clear skin, here’s a tip: simply try substituting maple syrup for sugar when cooking. I created this salad recipe specific for acne, the ingredients are great for treating acne. The beets will help clean toxins from main organs that most likely causing acne. Avocado will help reduce inflammation and help keep skin clear since it is full of vitamin E and C. The pineapple is a great source of vitamin C which plays an essential role in forming collagen. 1 avocado, cut in half, pit removed, and diced. Add dressing ingredients to a small bowl and whisk well. Set aside. To prepare beet, ad 4 cups of water to a pot. Add 1 beet and cook on medium heat for 40 minutes or until fork tender. Drain water and let beet cool down. Peel and cube. 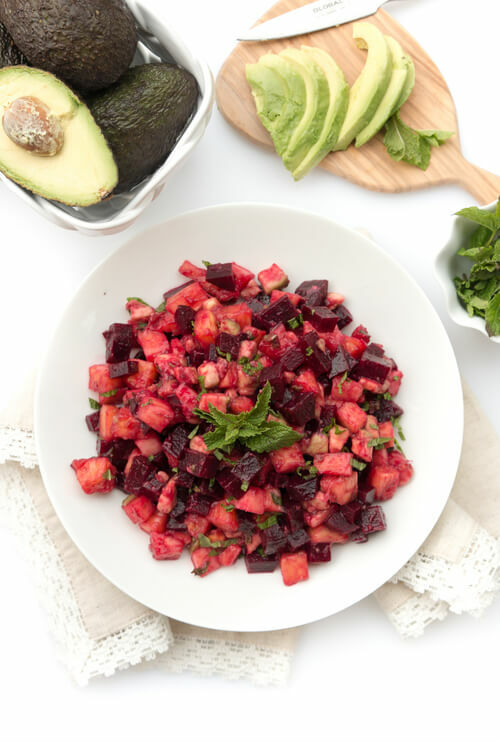 Toss beet, pineapple, and avocado together with orange dressing. Sprinkle chopped mint on top and enjoy!